A while back, I shared a housekeeping schedule perfect for new moms. 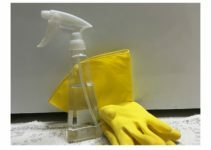 One of my largest pain points as a stay at home mom was finding a housekeeping schedule that worked for me. I would scour the internet, but never once did I find a schedule, made by someone else, that was right for me. And, as my house got larger and I added another kid, my needs changed again. I’m willing to bet you’re here for the same reason. 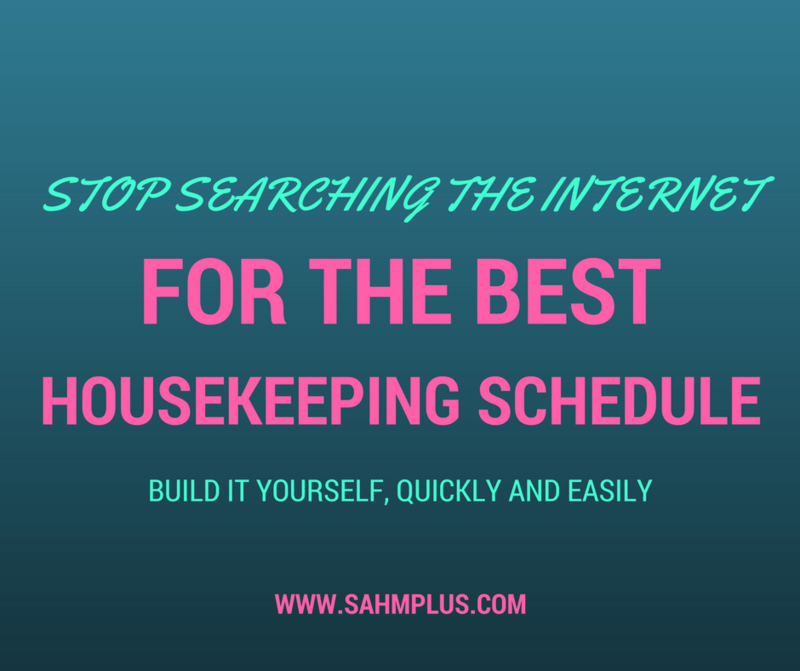 The truth is, if you’re searching for housekeeping schedules, you’ve likely found a variety of schedules. If you’re lucky, you might have found one that suits you. In my case, I’ve never actually found one that made sense. And, I’ve always had to customize or change up at least a few of the elements to make it work. Instead of giving you a blanket schedule and pretending it’s one-size-fits-all, I actually want to give you the tools to create your own schedule. You’ll be able to recreate and change your schedule as any new situation warrants. 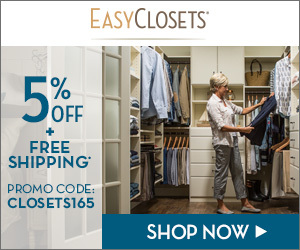 This way, you’ll never have to search out a housekeeping schedule that doesn’t work again. 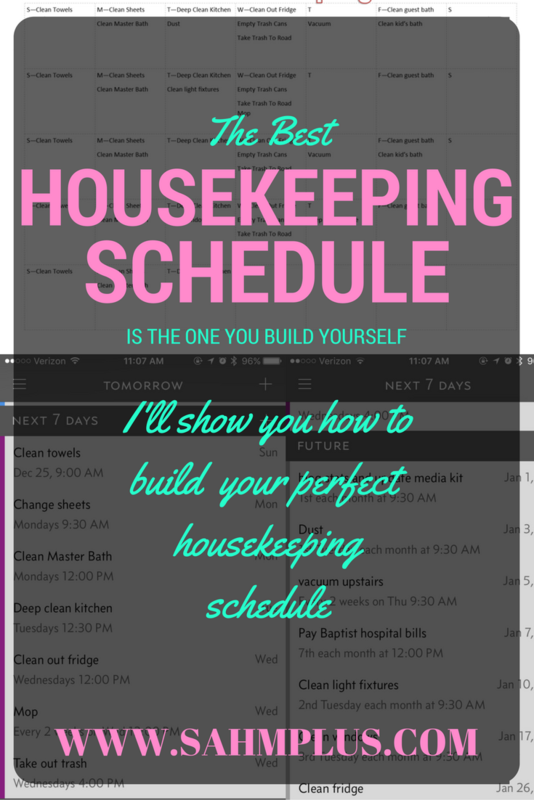 Instead, you’re building the best housekeeping schedule for you, as you work around your own family’s schedule. 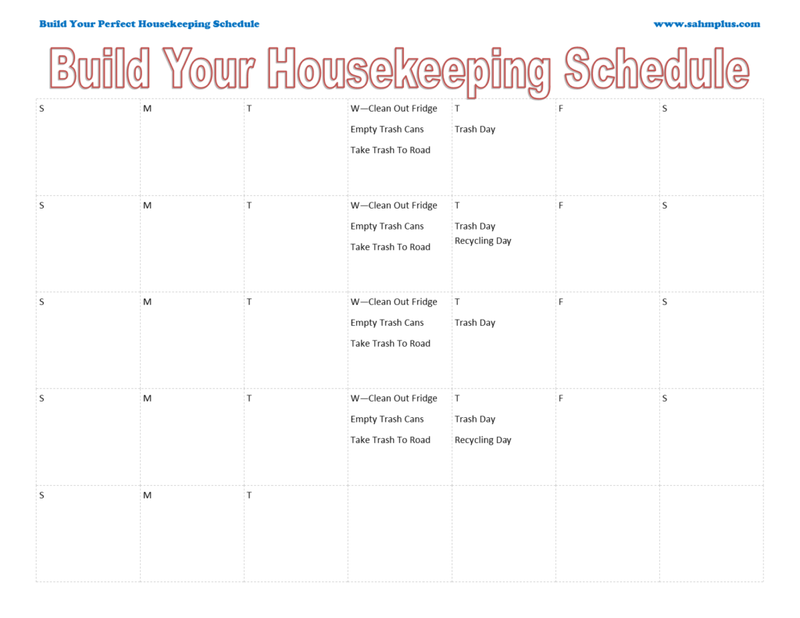 Build The Best Housekeeping Schedule! Please bear in mind that I build a SAHM schedule this way. 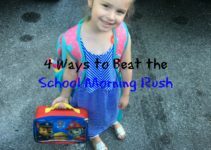 I completely customize my housekeeping schedule around naps, school drop off and pick up, and extracurricular activities. And, when situations or schedules change, I can rebuild my schedule easily! Your schedule goes everywhere (this is particularly helpful if you’re constantly on the go). After plugging in a task, set it on repeat according to your schedule. Set it to remind (or nag) you every few minutes (or however often you choose) until you complete the task. It keeps you accountable. I can set it to a specific time, working around naps and school schedules. The first part of building a workable housekeeping schedule is to start with working around absolutes. These are things like trash and recycling pickup. Block off days and times when you’re unavailable. I usually block off Saturdays for spending time with the family. And, I like to build in some time one day a week that I don’t have as much to do. 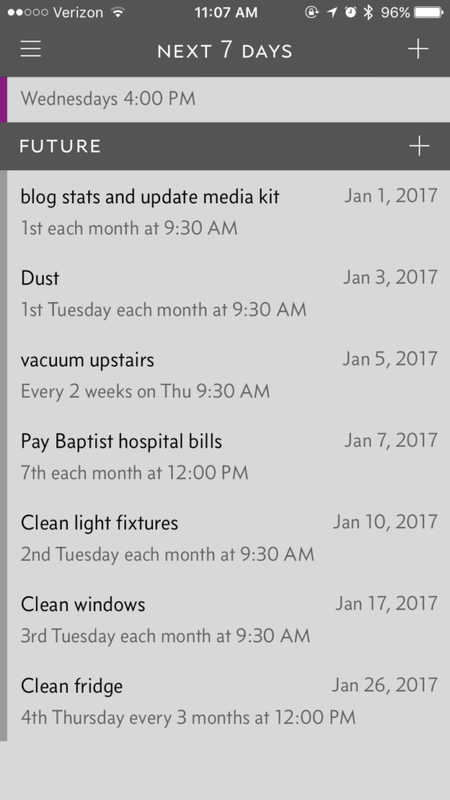 What tasks do you need to complete and how often? 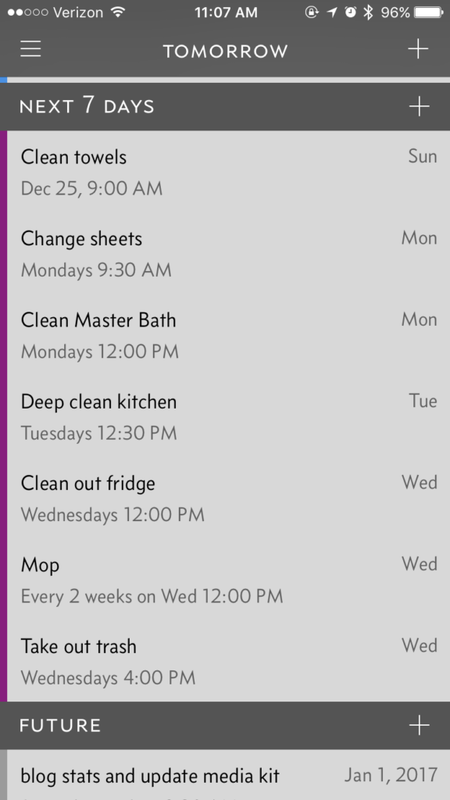 This is what my housekeeping schedule looks like. I prefer to leave Saturday and another day during the work-week semi-clear… it builds in time for me to rest, spend more time with family, or do some extra work. But, check out how nice it is in the Due app!!! Questions or comments about building the best housekeeping schedule? Let me know! Did you catch the first three posts in this series? I’ve been telling you this e-book was coming. And now, it’s GO TIME! I’ve launched my new e-book which will include the 5th topic (and my favorite) in this series. Plus, I include a few free resources that you can’t get here from any of these posts to supplement some of the stuff I have discussed. To celebrate the launch, I’m promoting the book for free March 10th, 11th, and 12th on Amazon! Check out my introduction to the book, which is essentially about time management for parents to decide if this book is right for you! If you’re a parent struggling with time management, you’re going to want this book. 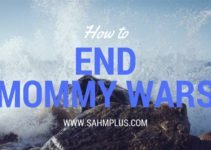 I share my secrets as a stay at home mom who tries to get it all done, including finding time to spend with my family and making time for my own hobbies and self-care. But, why pay for the book if you can get it free? Go ahead and sign up to receive my newsletter and I’ll tell you when you can get your copy for free or on discount!